A BUSINESS development consultancy is changing lives all over the world after becoming the first firm in the North West to join social change organisation Buy 1 Give 1. 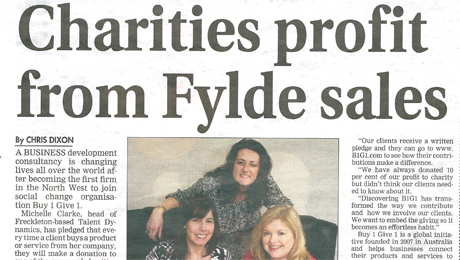 Michelle Clarke, head of Freckleton-based Talent Dynamics, has pledged that every time a client buys a product or service from her company, they will make a donation to one of the approved charities through the groundbreaking organisation. Before Christmas, 10 children in India received the gift of education for a month as a result of 10 coaches attending Talent Dynamics’ profile accreditation training. Mrs Clarke said: “The concept is simple. Every time a client buys one of our products or services we will give to a good cause. “Our clients receive a written pledge and they can go to www.B1G1.com to see how their contributions make a difference. “We have always donated 10 per cent of our profit to charity but didn’t think our clients needed to know about it. Buy 1 Give 1 is a global initiative founded in 2007 in Australia and helps businesses connect their products and services to more than 600 charities and good causes throughout the world. Hundreds of businesses in scores of countries have signed up but Talent Dynamics is the first in the North West to adopt the scheme.